Bring your dog of any breed for grooming and maintenance at Clippity Do Dog Grooming. 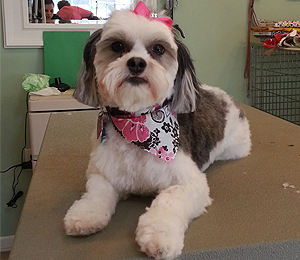 Our groomers are very well trained in grooming and animal behavior to offer an easy experience for your pup. We do not groom cats, so we have a fun environment for dogs to enjoy with other dogs with free reign, out of cages. Your dog will leave with a beautiful and healthy coat. Make sure your dog is current on all 3 vaccinations: Rabies, Distemper, and Bordetella. If your dog comes in to get groomed and our groomer notices that he or she has fleas, we’ll immediately inform you to ensure if it’s ok to provide flea treatment to your dog. We will use a pill called Capstar that kills the fleas within 15 minutes for an extra charge of $10. If you do not want us to treat the fleas, your dog will not be groomed and will have to be picked up. Dogs are not kept in cages during grooming visits to optimize fun and relaxation. If you request for your dog to be caged because your dog does not get along or work well with other dogs, we can do that as well. After a dog is groomed, the owner has 5 days to bring their dog back to get something touched up or fixed for guaranteed satisfaction.